Dentistry like any other industry is a competitive business. You need to showcase your services and talents in order to get a decent client base. Fortunately, digitalization has made that possible through online marketing. 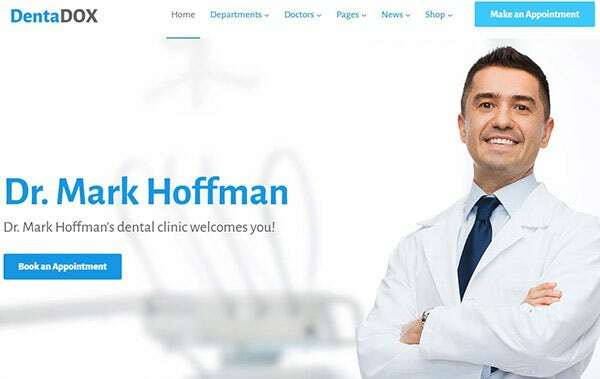 Our dentist WordPress themes have been designed specifically to advertise and represent your dental clinic business on the internet. 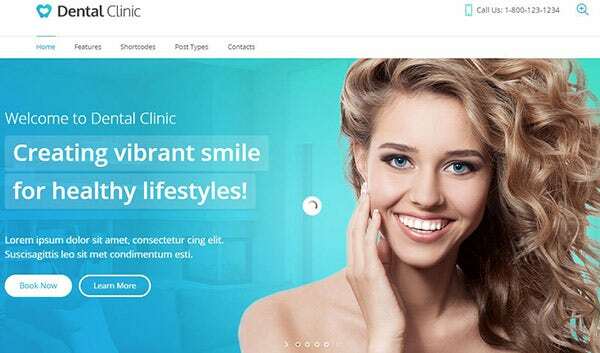 So, get hold of some of the amazing WordPress themes for your dental clinic. Dental Clinic WordPress theme is based on CMSMasters feature with Visual Content Composer and custom shortcodes. It comes with a Mega Menu feature and you can also sell your medical products online. It is SEO friendly and is coded with HTML5 and CSS3. Go for it and take your medical business to the next level. 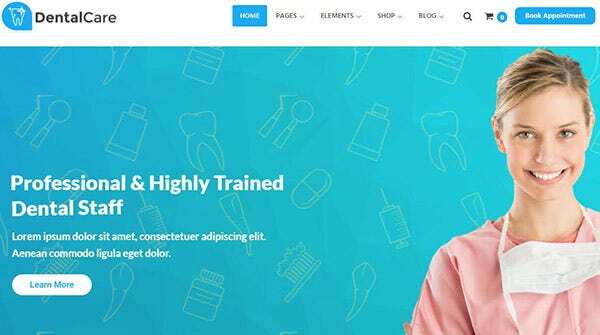 DentalCenter is built in with Drag-and-Drop Page Builder theme that helps you to build pages with more than 25 modules and easily customizable designs. It comes in with one of the most popular WordPress plugins the Cherry Services which helps you to use shortcodes and insert widgets anywhere in the page. Dental Care is a WordPress theme for doctors, dentists, orthodontists, dental clinics, endodontists, doctors, and medical organizations. It is powered by Bootstrap 3 and looks great on mobile devices. The Visual Composer feature with its drag & drop menu makes some amazing layouts. The Appointment Booking allows you to book your next sessions with your patients. MetaDental is powered by Drag-and-Drop Page Builder theme which allows you to set up your website with some really advanced features. You can create responsive galleries and beautiful page layouts and also create a photo gallery with pictures of your recent events. 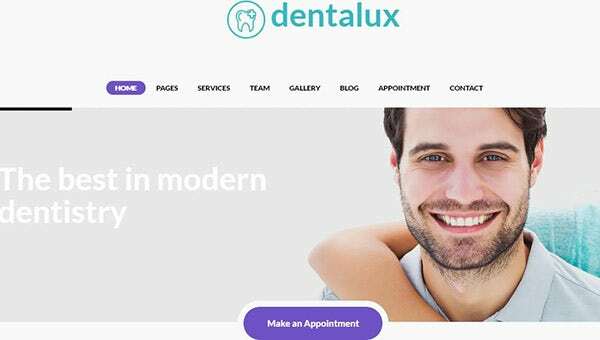 Dentalux is a new WordPress theme ideal for dentistry and is packed with some amazing features. It is Retina ready and has custom widgets like appointment management, dental services, booking sessions, etc. The homepage layouts are fully responsive and very easy to install with the one-click demo illustration. 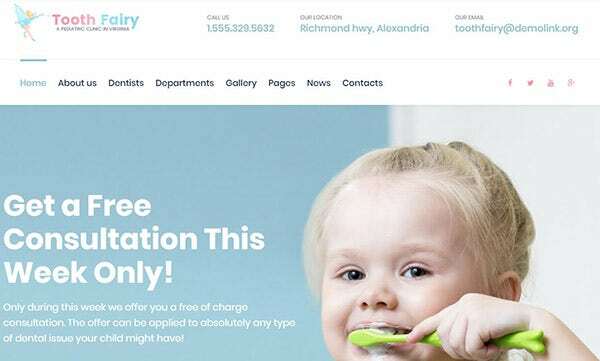 Tooth Fairy is a pediatric dentistry WordPress theme powered by Cherry plugins that enhance your website layouts and features. You will get 15 theme images for your website and multiple layout options in a built-in library to create your webpages. 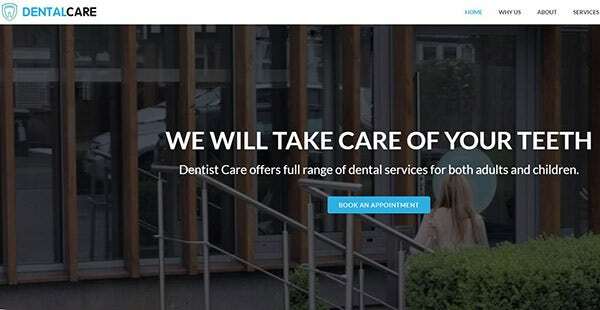 Denta, one of the latest WordPress themes is for dentists and dental services. Introduce your team members and their portfolios with the beautifully designed website. List your working hours in the timetable and highlight your clinic services in the most professional manner. It is customized with Advanced SEO that will guarantee the maximum visitors to your website. 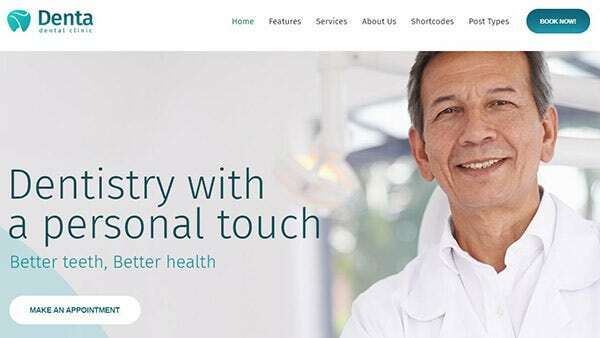 DentaDox is a medical clinic WordPress theme built in Elementor Page Builder module. The website can be perfectly built for smaller screens and as such makes it highly functional for your mobile phones. You get loads of high-quality images for your website and too absolutely free. 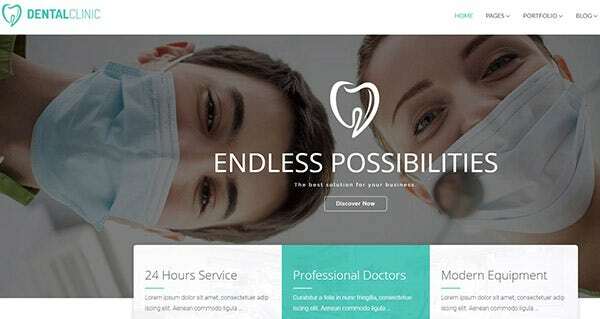 Dental Health is a beautifully designed medical WordPress theme for your dental clinic website. The pages have a left sidebar which helps in navigating. The Procedure Detail Page describes the popular procedures briefly which will help patients to get an idea about the procedure they are about to undergo. 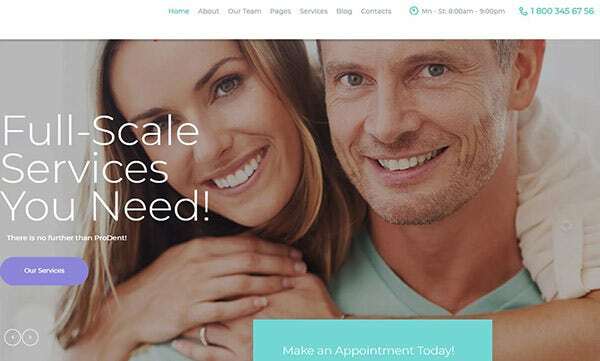 DentalCare is a fully responsive WordPress theme for your dental clinic website. It has built-in theme settings with which you can customize and set up color fonts, themes, and images within seconds. It is integrated with WPML with which you can now do business in any language. 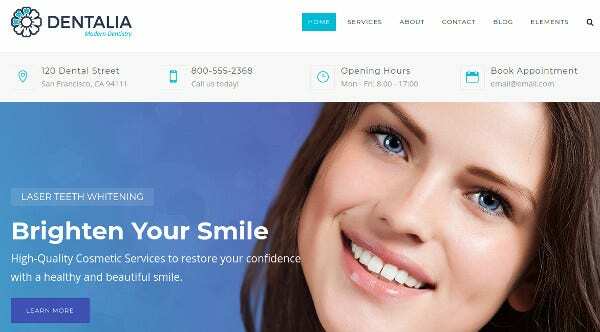 ProDent dental WordPress theme is compatible with WPBakery page builder and Revolution Slider that will give a unique look to your contents of the website. It is a mobile device ready with scrollable sliders and Retina-ready layouts. The multiple layouts come with beautiful Menu features and Parallax background effects. 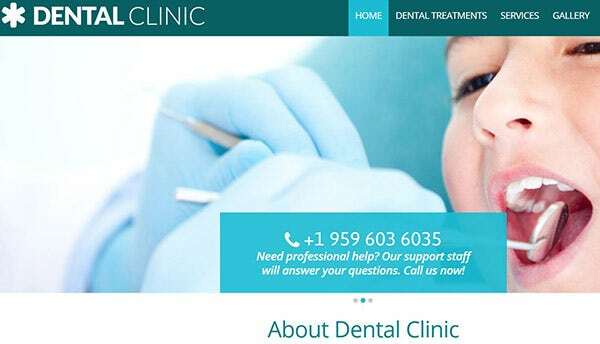 Dental Clinic WordPress theme comes with a 100% responsive design and fully customized post formats, which makes it an ideal theme for your dental clinic website. It is WPML certified and has a 2-step installation process which makes it really easy to use. It has more than 80 shortcodes and Custom widgets for your comments and social sharing section. Dentario is Gutenberg Compatible WordPress theme and comes with some of the best plugins. It has stunning demo layouts and is integrated with WooCommerce as well. It supports Sticky menu which gives a better navigation experience. It has multilanguage support and is equipped with beautiful Video slides. 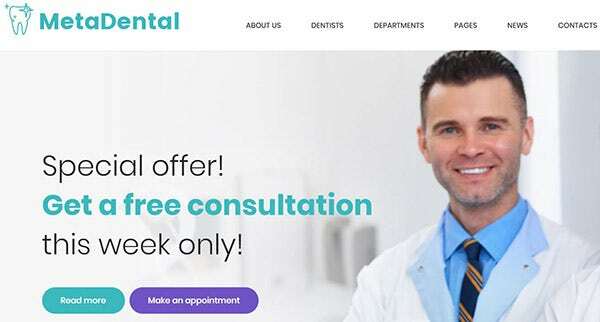 Dentistry WordPress theme is very easy to install and has a fully editable settings section which makes you customize your dentistry website easily. Its Filterable Portfolio section helps you to showcase your volume of work, achievements, and events in the most fashionable manner. 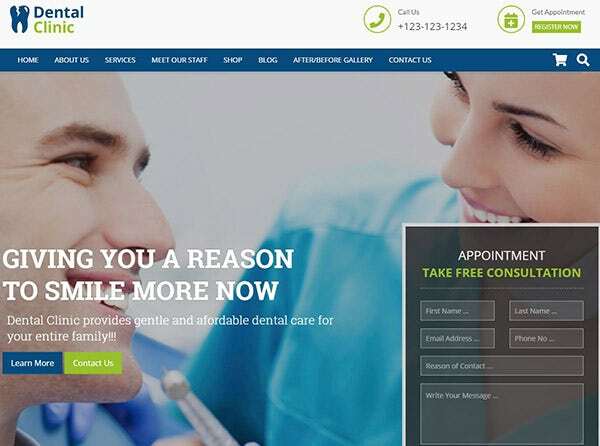 Dental is an intricately designed premium mobile-friendly WordPress theme for your dental clinic. It is based on SMT Framework 2.0 and is WooCommerce supported as well. Its responsive web design helps you to customize with all gadgets and mobile phones. 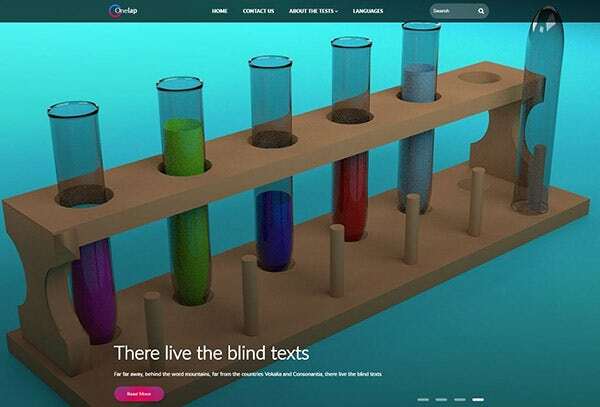 It has a Social Bar which helps readers to share your popular articles and blogs. 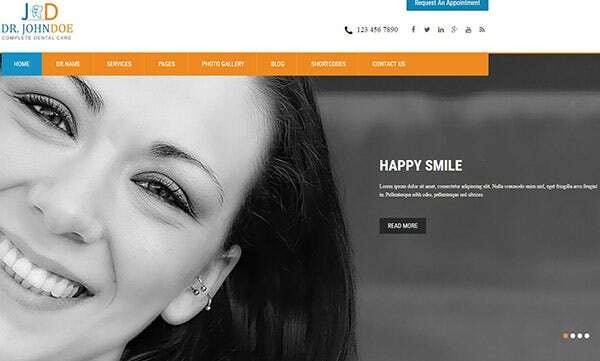 Dental Clinic is a freshly designed WordPress theme for your dentistry business. It is based on CWS Visual Builder and comes with beautiful boxed layouts and color schemes. 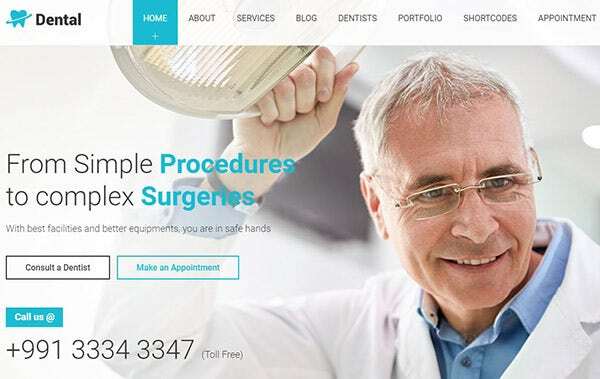 The Parallax effect gives the website pages a beautiful and attractive look and there is a video background section where you can add numerous videos pertaining to your clinic. OneLap is a multifunctional WordPress theme that is suitable for your dental clinic, spa, or healthcare facilities. Its Responsive Web Design makes it suitable for all gadgets and mobile devices. It has Custom Sidebars which gives a beautiful layout to your webpages. 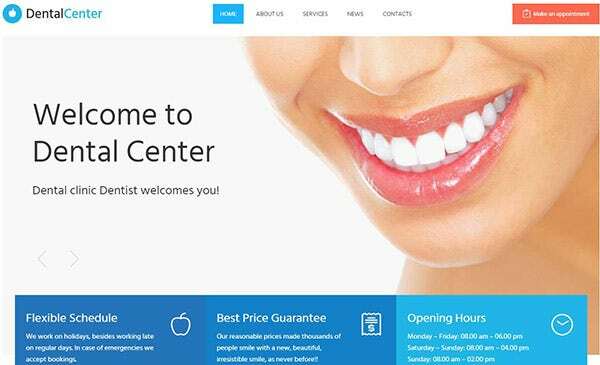 Dental Clinic WordPress theme is suitable for all dentists, dental clinics and hospitals. You can post your testimonials, doctors post, facts and service posts here and work easily with the page builder. The WordPress theme loads really fast and is super easy to use. The Customize Live Editor helps you to edit and customize your page settings within minutes. 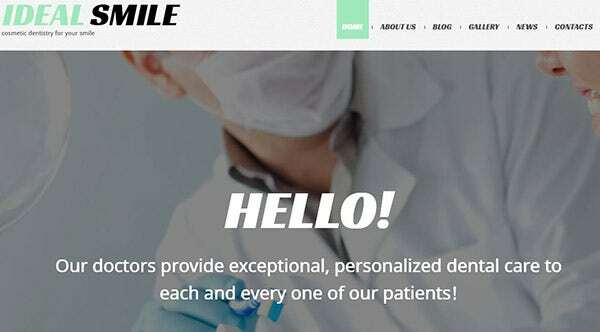 Toothy is a multilingual WordPress theme for dental clinics powered by qTranslate X. you can easily change the color of your theme with the Color Picker plugin. It is coded with HTML5 and CSS3 and is compatible with the latest version of WordPress. 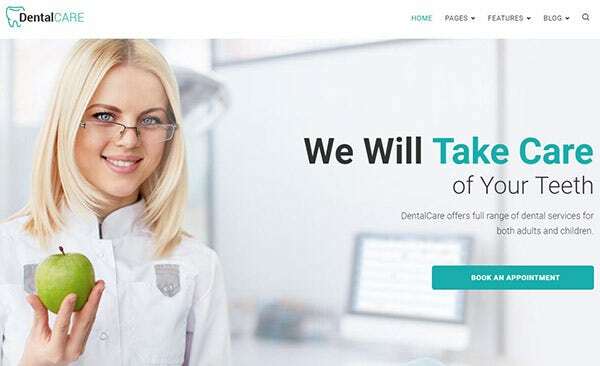 Dental Care is a premium WordPress theme that comes with more than 6 premium plugins that too at a very cheap rate. The color setting panel comes with unlimited colors and it is WooCommerce compatible as well. The WPML plugin allows you to convert the pages into any language. 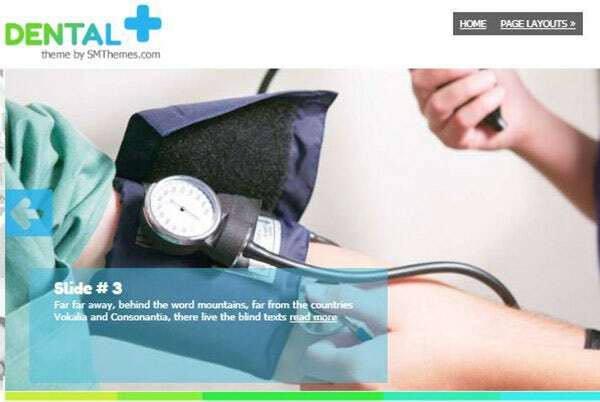 Dentalia is a WordPress theme specially designed for dental clinics, hospitals, and pharmacy. It is highly responsive and comes with some of the amazing Slider Revolution plugins. It is powered with more than 600 Google fonts and Gallery widget. This theme comprises of 120+ dental icons. Teethy is a responsive WordPress theme for dentists and medical practitioners. It is coded with HTML5 and CSS3 and has advanced header & footer options for your website. It is integrated with more than 810 Google fonts 100+ shortcodes. Being a dentist is not an easy job. You constantly need to communicate with your patients and keep a record of their progress. A beautifully designed functional website will help you ease your workload and also highlight your talents and portfolio in a professional manner. 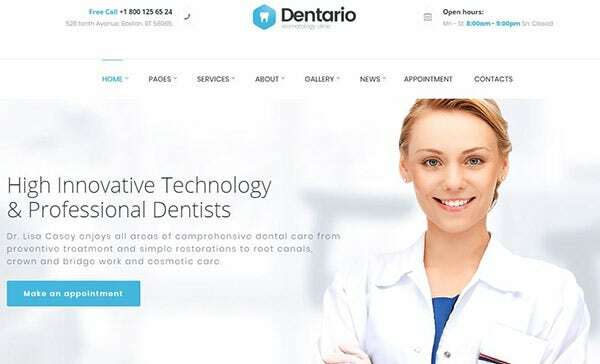 Our unique WordPress themes have been specifically designed for your dental clinic. It will help you to promote your dentistry career and also keep in touch with your patients.